Welcome all Catsters to the Pure White Kitty Club annual White Star Whitester Day. Each year on January 15th, a number of us white cats painstakingly choose some non-white kitties that have added something special to the Catster Community. In the following posts each white cat will announce an award to a special kitty. Please join the Pure White Kitty Club in conCATulating the following Award Winners. Now, who is an Olde Furt that doesn\'t know the Scootster? Scooter doesn\'t have one bit of white on her purrson, but deep down inside she is a A1 Whitester all the way to the heart. 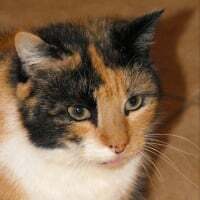 Scootie has such a loving personality she cannot go anywhere on Catster without spreading love and cheer and cracking a smile on the most stubborn of cats, and you all know there is not a more stubborn cat than ME! Scootie is even so cool as that she doesn\'t mind my occasional run through her Olde Furts group. Like this: S ... T ... R ... E ... A ... K ... ! Scooter. I present with a White Star to wear on your page. Please pmail me your email. If there is any cat out there that has not heard of sweet little Muppet 624959 then I'll eat my hat. She has been through so much in her short life, but is now on the mend with the help of a wonderpurr forever mum & some wonderpurr, caring Catsters. Purrlease go visit her page & read all about her life so far. You deserve this & more dear Muppet. I present with a White Star. Purrlease pmail me with your e-mail address so that I can send it to you to wear on your page. I chose my handsome husband Tucker as my cat to honor this year. He is a wonderful, loving kittie who is also very intelligent. He is a great detective, a loving companion and a fantastic brother to his sisfur Tessie and his new little brofur Tommy. I love him with all of my heart. I chose my friend Boudin. He also suffered from FLUTD like me, and he has been a complete comfort to me and my meowmy since I passed away. Thank you Boudin! I chose my beautifur wife, Katrine because she is so specia to me and to so many others on Catster. Katrine is always there to help any kitty who needs a furiend and with her gentle demeanor she is always a comfort to those who need it. My choice this year had to be Sweet Callie since she has pwamised to be my furefur mate. She is always there for me and for others. All de fellow think I am one lucky kitty, but we knew from de beginning dat we were meant to be together. Callie is always there to lend a paw to other kitties and help them with anything she can. Any cat is lucky if they are in her circle of furiends. I wish to give my White Star award to Teebo for being such a wonderful friend. =D>=D>=D>=D>=D>=D> For all the White Star Winners. Efurry one of you deserves this award. I\'m so proud to present my White Star to my wonderful friend Sagan! Sagan is a great friend and a very caring kitty who is there when his friends are down and need him. He really deserves the honor of a White Star! Sagan, please p-mail me your email address so I can send you your White Star. This year we want to give our White Star to Sadie because she is a one true monkey kat. We hope Sadie will enjoy it.